These services has been re-timed and re-routed to improve reliability, the section of route between Transit Way and Derriford Hospital has been withdrawn with the current Service 61/62/A being replaced as follows. Service 61 will operate every 20 minutes during the day Monday to Saturday, every 30 minutes daytime on Sundays and hourly in the evenings Sunday to Saturday. Service 61 will operate from the City Centre to Mutley Plain, Peverell, St Pancras, Honicknowle, West Park, Transit Way, Brake Farm, St Pancres, Peverell, Mutley, City Centre. Service 62 will operate every 20 minutes during the day Monday to Saturday, every 30 minutes daytime on Sundays and hourly in the evenings Sunday to Saturday. Service 62 will operate from the City Centre to Mutley Plain, Peverell, Brake Farm, Transit Way, West Park, Honicknowle, St Pancres, Peverell, Mutley, City Centre. New service 61 & 62 will provide a combined bus service every 10 minutes between City Centre and Peverell it also increases the number of buses operating in St Pancres to every 10 minutes and increases the number of buses operating between Mutley/Peverell to Transit Way to 6 buses an hour . If the 61 is withdrawn from going to Derriford Hospital in the proposed timetable/route changes does that mean that there no buses going to Derriford or crownhill from the pennycross area ? This has issue has also been posted across Derriford Hospitals internal email system urging staff to complain to try and get at least some through buses on these routes. This Service has been retimed to improve reliability. Service 50 will continue to operate every 15 minutes although this new timetable will extend that frequency over more of the day. Evening Services have been increased in frequency from hourly to every 30 minutes Sunday to Saturday. However the ability to stay on the service 50 bus as a through link between Derriford and Transit Way on Service 61 and Service 62 will no longer be possible. The original proposal was to extend the 50 to Derriford Business Park and Marjons. This would have been ideal for me working on Business Park but I am not at all surprised that the extension is not happening as no other bus service has managed to last long on this site. It now seems I have to get off the bus at Derriford and either walk (something I try not to do to often) or catch another bus for the last section. If the upshot is an improved service on the 50 generally then I guess this is a small price to pay. The biggest improvement is the straight forward 15 min frequency all day in both directions. The 50 is odd in that at the moment the peak service is worse than the normal day time service, at least heading towards Derriford in the morning. 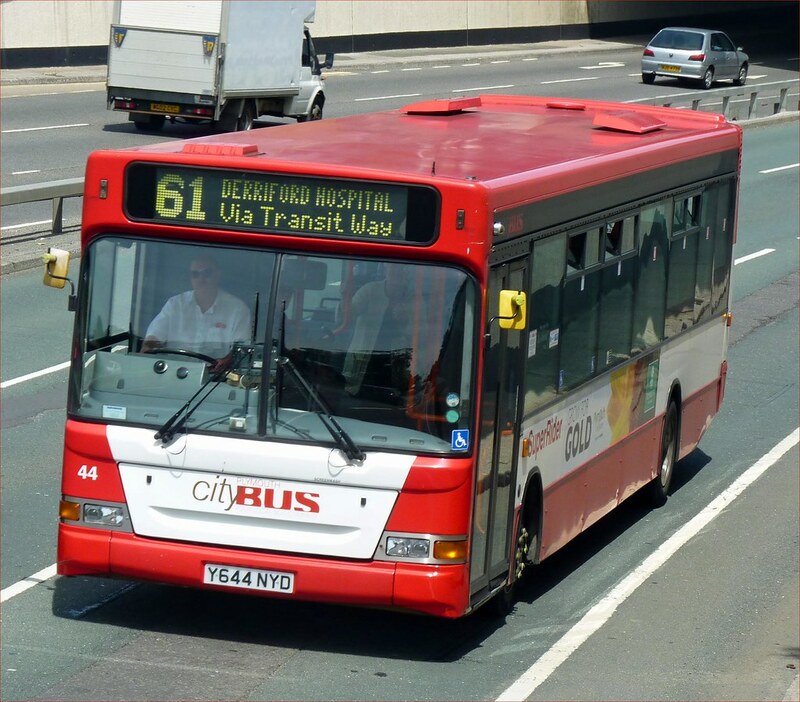 The 61, seen heading away from Derriford Hospital but on the way to Derriford Hospital. The convaluted 'loop' so that Crownhill Village gets served sees several buses like this heading off in different directions! There has been quite a bit of discussion about First Devon & Cornwall and how they are going to respond to all of these changes, along with lots of suggestions as to what people think they should do. If the rumours are true then we should see something very shortly happening for Ivybridge, but I dont suppose we will see much else happening just yet. Of course I could be wrong! It's not at all uncommon to see 50/61/62s bunched up, though what it normally is is for example 2 50s, a 61 and no sign of the 62 or any other combination of that! Another example of this is the other day, a 'City Centre 62' was pulling out of Transit Way, just up Crownhill Road was another City Centre 62, with no sign of a 50 at Derriford. In the evening peak a 50 arrives at 1656 (normally 5PM as it usually picks up a delay with traffic at Marsh Mills etc,)though at about 4.57 down comes another Dart which is left there for 10 minutes as it's not due out until 1706. This then means the Dart on the 1656 departure which as I said is usually late drives by without picking anyone up, then at 1716 it's not uncommon to have 2 double decks following eachother all the way into town! This is because one comes off the 102 school bus to Glenholt Park, and another comes off a 34 to Derriford. The 1715 34 is handled by a DD from the 101 school route to Tamerton, and a Dart from the 1610 50 to Derriford, which when arriving at Derriford it changes to 'Not In Service' and does the 1707 departure from the Estover factories. Having said that, the 1715ish 34,28B and 50 are all duplicate services as one bus comes off a school run so there's always the chance (especially with the 28B) to be a yellow step entrance decker. I know there's not really much else Citybus can do though I just think 2 deckers on the 50 following eachother into town is a bit of a waste! I'd put the decker from the 102 school route on the 1708 62, it's nearly always full and standing. Though when it gets into town it changes to the 1810 28B and seeing how bad B7s are on the hills it may not be such a good idea! Anyway, back to the point, losing the Derriford section of the 61/62s has proved to be very unpopular and I and I'm sure many others really do hope Citybus will restore at least 1 to Derriford, maybe just a peak service at the bare minimum. Though as I said above it's not uncommon for this group of services to have 2 of 1 service 'bunched up' with no sign of the other! It should lead to a more reliable 50 service though which is good news. The original plan was to negate the loss of through buses from Peverell, Pennycross, Honicknowle and Brake Farm to Crownhill and Derriford Hospital with a 20 minute service 29 so that connections could be made at Transit Way. With the 29 looking like its staying with a 30 minute frequency this just looks like a straight service reduction.